"The Daniel Fast for Weight Loss" is a different approach to take for losing weight as it focuses primarily on a spiritual component. One's relationship with God is the main focus of this diet and program for weight loss as there is fasting and really focusing on focusing on God and seeking His help and guidance. Susan really goes into details on this plan and stresses following the plan exactly in order for the optimal results. Before beginning this diet/fast plan, it is important to read through the first couple of chapters thoroughly before starting the 21 day plan. An excellent feature of this book is the inclusion of many, many recipes that fit into this plan. This is a very intense plan for 21 days and a great starting point for those who want to maintain a healthy weight and good eating habits for years and years. Upon crossing the country, however, Miranda and her grandfather discover their new auction house doesn't deal in fine antiques, but in livestock. And its frustratingly handsome manager, Wyatt Ballentine, is annoyed to discover his fussy new bosses don't know a thing about the business he's single-handedly kept afloat. Faced with more heads of cattle than they can count---but no mysterious painting---Miranda and Wyatt form an unlikely but charged partnership to try and prevent a bad situation from getting worse. Regina has once again written a novel that will keep you completely engrossed from the beginning to the end as she creates such lovable characters and storylines with humor and heart. Regina dives right into the story and into Miranda's world on the very first page with detailed descriptions that set the scene and begin taking the reader on a journey into the world of family businesses, auction houses and a trek across country. Miranda's world becomes intertwined with Wyatt's in the midst of misunderstandings, panic and despair. Thus begins a series of interactions and partnering to find a missing painting. I highly recommend this book and this series AND any book written by Regina for fans of historical romantic fiction. Retired hall-of-fame football coach Jimmy "Coach" Westbrook never imagined anything would come of his labor of love---the wedding chapel he built for Collette Greer, the woman he fell for back in '49. But now an offer has come to turn the chapel into what it was meant to be---a place for love---and Jimmy sees no reason to hang onto his dream any longer. Photographer Taylor Branson is trying to make a life for herself in New York. Leaving her hometown of Heart's Bend, Tennessee, she put a lot of things behind her, including her family's abysmal marriage rate. But love surprises her when she falls head-over-heels for Jack Forester, a top ad man. Their whirlwind romance results in an elopement, and a mountain of doubt. Jack, while genuine in his love for Taylor, can never seem to overcome his own demons to find the words of his heart. When Taylor takes an assignment in Heart's Bend, the job does more than send her back to her hometown, but into a world of family secrets buried beneath the sands of time. When Taylor's journey intersects with Coach's, they rediscover the heartbeat of their dreams and that the love they long to hold is right in front of them. And worth every waiting moment. This latest novel from Rachel Hauck is in my top ten favorite books that I have read this year. Seriously, it is very well-written and with two stories woven together I was completely wrapped up in all of the characters' lives and their stories spanning across generations and years. The chapel that Jimmy lovingly built with his hands has set empty and has been a secret for so many years and this amazing piece of architecture brings Taylor back home. This story just immediately tugged at my heart and really pulled me in beginning with a photograph in 1948 and the devastation of war and then in the next chapter jumping ahead to present day. I loved how the chapters flowed seamlessly back and forth among decades; I never felt confused or lost. I cannot even say enough about this book, just that it is not to miss. It is such a sweet story filled with emotions and the characters all dealing with individual things in their lives and also relationship issues as well creating such a great read. This is a great collection of recipes for those whom are trying to make better food choices and really for anyone who wants to eat well, meaning recipes that are good for you and also taste good. What I love about the Food Network cookbooks is the variety. There is such a huge variety of recipes in this book. There are recipes for every course, including snacks. Also, there are recipes that use common, everyday ingredients and then also recipes that include less common ingredients, but sound just as tasty and would be a nice change from the usual food that one is used to making and eating. I also love that there is a picture of each and every recipe in this book. With 150 recipes in this book, there is something for everyone and don't let the title lead you to think that the recipes are boring or tasteless, that is far from the truth! To read more about this book go here! They're the unlikeliest of friends-but can Lydia REALLY trust Sebastian? "Whispers in the Reading Room" is my favorite of the Chicago World's Fair Mystery Series; I love the storyline, the characters and the suspense. Of course, the love the whole library setting and the occupation as being a librarian and Lydia is such an intriguing main character. She loves the world of books, but also loves to people watch and she is completely intrigued by the ones whom she comes into contact with, especially a certain handsome, quiet man. Sebastian Marks is such a wonderful main character as well and I love how the various facets of him are revealed throughout the story and throughout the development of his relationship and his interactions with Lydia. I love the twists in the story and the suspense as it kept the story moving and had me engrossed in the story from start to finish. "The Forgotten Recipe" is book #1 in Amy Clipston's Amish Heirloom series, and it is an excellent start to the series that will tug at your heart and take you back into your own memories of family recipes. I loved how the storyline revolved around a newly found heirloom recipe. A recipe that has not been made in years and is an instant hit with people who stop by the bake stand. This pie forms a connection with Jason and Veronica; although Jason knows they have another connection as well and is hesitant to share it. Veronica and Jason are both such great main characters, I found myself empathizing with both of them and becoming completely immersed in their world. I am looking forward to book #2, "The Courtship Basket," as I loved book #1 and the concept of this series. I love Christmas stories and this collection of four Christmas novellas are excellent! Each of the four novellas focuses on a young woman; however each of them are connected as their mothers all went to the same home and same midwife to prepare for the delivery of their babies. This four babies, now years later, have grown up into adults and are living different lives. I really enjoyed each of these stories, and each of the authors really brought to life the characters in their stories and was able to meld their piece with the other stories so well that they just flowed together seamlessly. There is sadness, hope, giving back and love woven throughout this book making this such a beautiful Christmas collection and the gorgeous cover makes this the perfect Christmas book to share this season. I loved, I mean really loved, the latest non-fiction book on to read pile and it was one I read over the period of two days. "Raising Kids in an Entitled World," so aptly described the society in which we are raising our children and how our habits are resulting in entitled children instead of grateful children. I have enjoyed scrolling through and reading various posts on Kristen's blog and was so excited when I saw this book by her. Kristen shares her heart in this book and her stories that make up her own family's journey of raising their children in today's society. I love how this is Kristen's story, but also research tied in with it. Kristen and her husband's boot story near the beginning of the book is such a great illustration and one that I know will pop into my head throughout various moments of raising my children. This book flows so nicely and I love the quotes and tips that are interspersed and included at the end of the chapters. I know this will be a book that I will refer back to over and over again as my children grow. Kristen is such an encouragement and this book is exactly what I needed to read at this time. I highly recommend this book for parents of children of all ages. I loved Melanie's retelling of the Rapunzel story. "The Golden Braid" is a well-written story that will transport you back to your childhood with her flair for story telling and the fairytale feel. The characters become so real and the story is filled with adventure and humor. Rapunzel is sheltered by her mother and wonders if she will ever fulfill the desires of her heart and control her destiny. I love how Melanie creates believable characters whom come to life and ones that are easy to empathize with. Also, the faith element is woven into the story adding so much to it, but not overpowering it and detracting from the storyline. If you are a fan of fairytales, and historical romance this is for you, young or old. Dan Walsh's new novel is one that you will reread every year at this time. "Keeping Christmas" is a sweet, touch story that will stay with you long after you finish reading. Dan has done another incredible job with writing this novel. The characters come to life and work their way into your heart as you empathize with their current life situations and as you struggle right along side them to come to terms with changes that have taken place forcing them to adjust to losses in traditions and family times. Stan had no idea this year would be so difficult for Judith, and he had no idea how to help her at first. This couple has just celebrated Thanksgiving alone, to Stan it was seemingly not a big deal, but when he arrives home the following day to a house completely void of Christmas decorations and his wife struggling with the holidays and lack of family surrounding her, he realizes just how difficult it is. Judith is struggling with the fact that she does not have a purpose in life anymore as she is seemingly not needed, not an important piece in her children and grandchildren's lives as they live so far away, living their own lives. 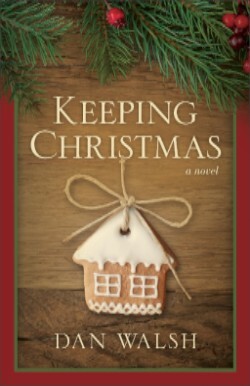 I highly recommend "Keeping Christmas" as a must-read this Christmas season as you will not be able to read this without your heart becoming fully involved in the story and intertwined in the characters' lives. The book of Proverbs is a wellspring of wisdom, offering practical guidance for life and the tools to make good choices, withstand pressure, prioritize relationships, and avoid unnecessary trouble. Now bestselling author John Mason helps you make that wisdom a part of your inner life. For thirty-one days, he takes you through each chapter of Proverbs, unpacking the wisdom within and providing a heartfelt prayer based on the insights from that chapter. As you read and pray, you'll discover the principles found in this wisdom-packed book coming alive in your life in ways you may never have imagined. John Mason is a minister, a popular speaker, and the bestselling author of many books, includingAn Enemy Called Average and You Can Do It--Even if Others Say You Can't. His books have sold nearly two million copies and have been translated into more than thirty languages. He is the founder and president of Insight International and Insight Publishing Group, organizations dedicated to helping people reach their God-given dreams. He lives in Oklahoma. 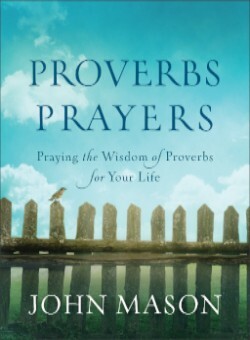 This book is a wonderful collection of prayers that take the reader through the book of Proverbs. The layout of this book is so simple and straightforward as it includes every verse in the given chapter followed by a prayer that focuses on that specific chapter. I love that the verses are included so that they are right there and easy to read and connect with the prayer. There is also a section included at the back of the book that states various principles throughout Proverbs and what each principle actually is along with a verse that highlights it. This would make a wonderful gift for anyone who needs a little bit of encouragement in his or her life.